Einstein said that, a really long time ago. I never really gave it much thought until today. Today, I was presented with a fantastic opportunity and I decided to seize on it. The opportunity involves a birthday gift to myself. Last year’s gift was pretty big, and I had been thinking about what I could give myself that was better than the gift I bought myself last year, because my sleeve is the gift that keeps on giving. And that’s no joke. 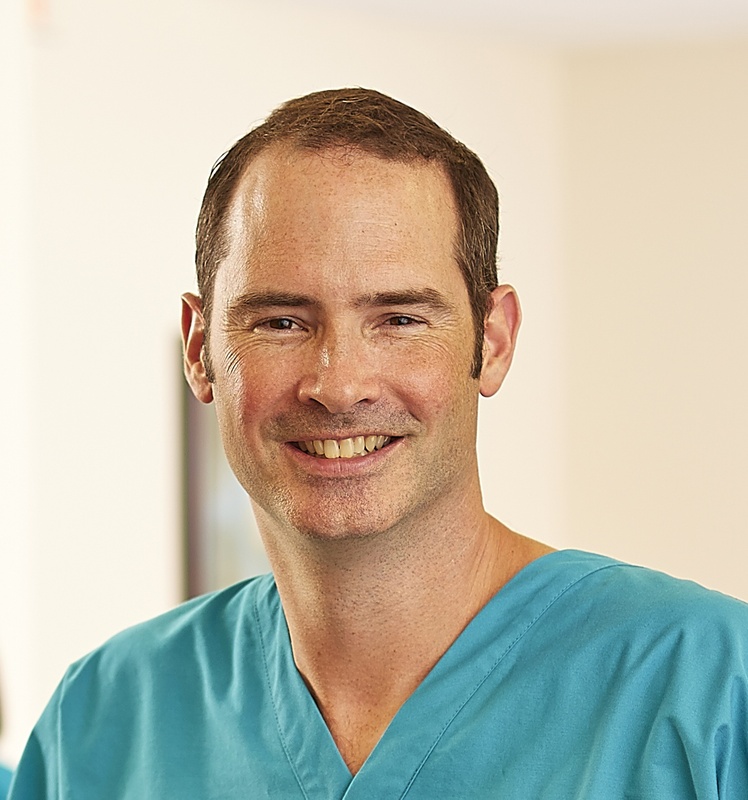 That’s my surgeon, Nick Nicholson. BEST EVER. 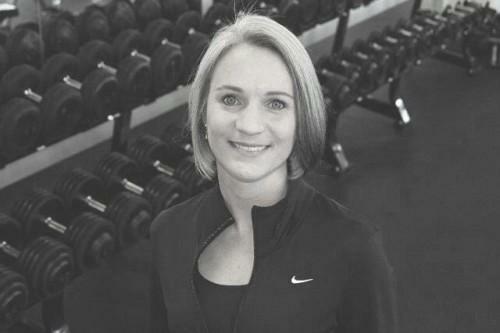 Her name is Kori Hendrix and she is a fitness coach. She came to our Rotary Club meeting this evening and spoke about life balance (how timely was this!) and how one can achieve it by adding fitness into one’s schedule. I asked her what a consultation looks like, and she explained what was involved. After visiting with her for about 15 minutes after my club meeting, I decided that I wanted to go through with a consult and fitness assessment. I’ve reached out to her via email and am awaiting word on a time and place to do the assessment and consult. I realize that I am at a place in my weight loss where the help of a professional is going to help me build strength and flexibility. Working out on my own is not cutting it, and while my friends all say “use YouTube,” I really do learn best by being physically shown how to do something. I truly am the most physically uncoordinated woman on the planet, and I don’t want to injure myself while exercising. The last thing I want is to get hurt while I’m working out because that will just set me back and piss me off. I’m excited about the possibility in this opportunity, and I think that I could not have crossed paths with Kori at a better time in my life. I’m struggling with how to proceed in my workouts to get the most benefit from them, and I am hopeful that she is the person to help me. I’ve never been able to do this before. When I bought this watch, it was snug on my wrist. Now, there is roughly an inch between my wrist and the bottom of the band where the clasp is. I might have to have a link or two taken out so that it doesn’t slide around so much! This little epiphany is exciting to me because now it means I can wear cuter bracelets! I don’t think I’ll ever be able to wear bangles, because my hands are so big, but at least I can buy 7″ bracelets now instead of 8-9″ ones. I didn’t have a chance to call my PCP today, damned schedule. Tomorrow I plan to call her office during my conference period. Here’s to hoping the news isn’t terrible and that I don’t have to have an ultrasound for my gallbladder. Today’s eating was okay. I got in 94 grams protein, 34 grams carbs and 44 grams fat, with a calorie count of 953. I also drank a gallon of water. I exercised for 30 minutes by playing my Walk It Out Wii game to offset the fried okra I had at dinner. I wanted to try them, and was sorely disappointed that they were not as good as I’d hoped. Won’t be doing that again! 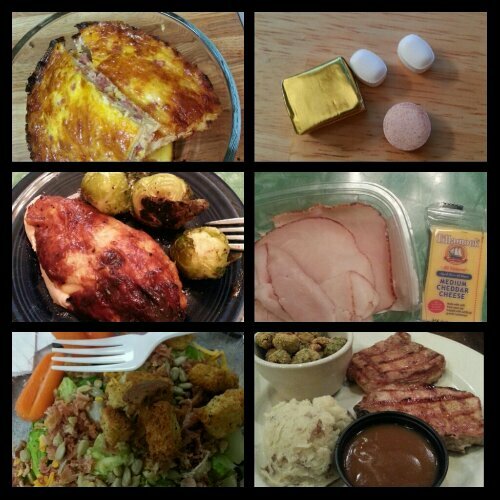 Today’s food choices, from upper right: multivitamin and calcium supplements x2, iron supplement; deli sliced turkey and cheddar cheese; pork loin chop, mashed potatoes, brown gravy, fried okra; mixed green salad with cheese, bacon, sunflower kernels and croutons; roasted barbecue chicken breast with roasted Brussels sprouts; ham, egg and cheese breakfast casserole. This entry was posted in being thankful, exercise, goals, la guerra, oh behave!, planning, post-op, the body is a funny thing, the sleeve, vsg, weight loss surgery, werk! and tagged being thankful, benefits of wls, dr. nicholson, exercise, fitness coaching, fitness goals, kori hendrix, la guerra, NSVs, opportunities!, post-op eating, post-op life, VSG, vsg realness, what's up doc?, WLS, workin' on my fitness. Bookmark the permalink. What a great NSV with your wrist size! 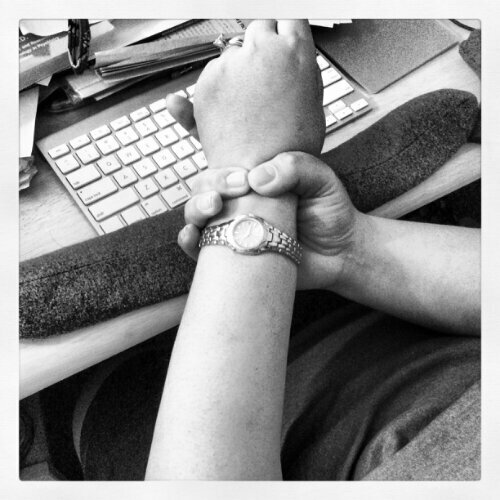 My wrists (and fingers) are huge and I’m hoping that they will get smaller after I’ve lost some weight. It has been an unexpected NSV that’s for sure. My fingers are also down 2 ring sizes–my college ring doesn’t fit my ring finger any more, so I’ve moved it to my middle finger since I can’t get it resized. My wedding band and engagement rings are too big, and I’ve got a ring guard on my engagement ring. I think today I am going to go get one for my wedding band because any day now, I feel like I’m going to be gesturing in class and it is going to fly off!